Counting down for Christmas is a popular family tradition. You can make yours’ centered around activities or use to teach the meaning of Christmas. Slowly add pieces to the Nativity set. First week: straw, stable, and animals. Second week: Mary and Joseph a short distance away. Third week: Angels, Star and Shepard(away from stable). Fourth week: Wise men away from stable. Christmas day: Place Mary, Joseph and Jesus in the stable. Place Shepard and wise men short distance away. Instructions for making a Star Countdown Chain can be found here. Clothespin small socks or mittens to a piece of twine. Place a slip of paper with an activity written on it in each one. Carefully mark off 25 squares on a piece of poster board. Leave at least a 3/8″ between each square. Mark a line in the middle of each box that designates the halfway mark horizontally. Mark a line lengthwise through the box using this mark as a guide. Cut with a craft each half-way mark and the top and the bottom of each box. The boxes should be able to open as a window. Behind each window tape a Christmas picture or an activity for the day. The genealogy of Jesus starting with Adam and Eve. Prophecies of Jesus’ coming from the Old Testament and the fulfillment from the New Testament. Attributes of God/Christ e.g. the rock, a door, etc. Instructions for wooden dowel tree with symbols and readings can be found here. Wrap 25 blocks with white paper. Can decorate if desired. Each night decide on something the family is thankful for and write it on a block. Or you can write a prophecy and fulfillment on each block. Collect 25 sturdy boxes with separate lids. Paper mâché nesting boxes would be good. Wrap the boxes and lids separate from each other. Label the boxes with numbers from 1-25. Decorate the boxes as desired. In each box you can place a piece of the nativity, a scroll with a prophecy printed on it, or an ornament for your Jesse Tree. Place these under the tree. Use a large wall calendar. Each day glue a bow to the date. On a long piece of ribbon tie a bow for each day of Advent. Drape the tree with the garland or hang on the wall. Drill 25 holes in a long log. Place 24 red candles and one white candle (in the center). Alternating ends of the log, each night light the number of candles of that days date. Christmas Day light all and the white candle. Look up traditions celebrated in other nations. Make a craft or read a story about that custom. Trace the hands of the family members. On each hand write an activity, story to read, Jesse Tree reading, etc. Each day draw out a hand do activity and glue hand to a Styrofoam wreath. 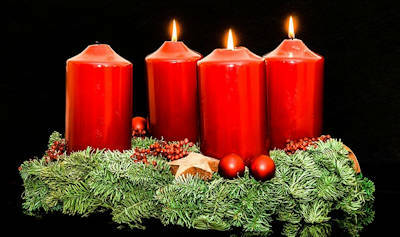 Do you have an advent tration? Please share in the comments below.